On Tuesday, the U.S. Anti-Doping Agency (USADA) announced that an arbitrator from the American Arbitration Association (AAA) ruled Jenna Blandford of Louisville, Kentucky should receive a four-year ban for possession and use of prohibited substances. The ruling against Blandford is based on non-analytical evidence of possession and use of testosterone, human growth hormone and oxandrolone. The decision states the non-analytical evidence was obtained from her ex-partner Jeff Miller after the couple broke up. The ban is effective as of November 20, 2017, and Blandford has to forfeit all results and prizes from September 1, 2015 onward, which was determined as the approximate date when she began doping. Blandford finished second in the Baby Masters (30-34) category at both the 2015 Austin and 2016 Asheville U.S. Cyclocross Nationals and raced at the UCI level the past several years. Her podium in Asheville will be vacated by the ruling. USADA announced today that an arbitrator from the American Arbitration Association (AAA) has rendered a decision in the case of cycling athlete Jenna Blandford, of Louisville, Ky., and has determined that Blandford should receive a four-year sanction for the use and possession of prohibited substances. In 2016, USADA obtained non-analytical evidence that Blandford, 33, possessed and used three prohibited substances: testosterone, human growth hormone (hGH), and oxandrolone. Testosterone and oxandrolone are non-Specified substances in the class of Anabolic Agents, while hGH is a non-Specified substance in the class of Peptide Hormones, Growth Factors and Related Substances. These substances are prohibited at all times under the USADA Protocol for Olympic and Paralympic Movement Testing, the United States Olympic Committee National Anti-Doping Policies, and the Union Cycliste International Anti-Doping Rules, all of which have adopted the World Anti-Doping Code and the World Anti-Doping Agency (WADA) Prohibited List. Blandford’s four-year period of ineligibility began on November 20, 2017, the date her sanction was imposed. As a result of the doping violation, Blandford’s competitive results obtained on and subsequent to September 1, 2015, the approximate date she first used a prohibited substance, have been disqualified, and any medals, points, and prizes are forfeited. Updated. 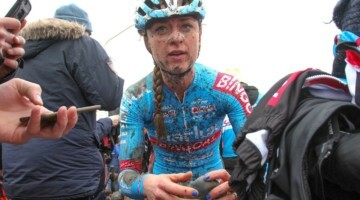 Cyclocross Magazine reached out to Blandford for comment, and through her lawyers at Craig Henry, LLC, she issued this statement. Craig Henry PLC is proud to represent elite-level cyclist Jenna Blandford. In May 2017, the United States Anti-Doping Agency, relying on a retaliatory report submitted by Ms. Blandford’s former boyfriend, charged Ms. Blandford with the possession and use of prohibited substances. This week, relying on unsubstantiated and discredited evidence, the arbitrator overseeing the proceedings between the USADA and Ms. Blandford sanctioned Ms. Blandford in a decision finding that she violated the USADA’s anti-doping rules. The decision is unfortunately and disappointingly premised almost entirely on suspect, retaliatory testimony and “evidence” provided by Ms. Blandford’s former boyfriend, J.M. In 2016, J.M. threatened to falsely report for Ms. Blandford to the USADA for doping if she left him. Ms. Blandford proactively reported the threat to the USADA by email but received no response. As expected, when Ms. Blandford left the abusive relationship—which required the intervention of law enforcement on Ms. Blandford’s behalf—J.M. falsely reported her to the USADA for doping. Ms. Blandford passed the test the USADA administered to test for prohibited substances. The USADA’s investigation included only two interviews: an interview with J.M., who admitted he purchased and used the prohibited drugs, and an interview with Ms. Blandford, who continually denied the allegations and requested the USADA speak to others about who could attest to J.M.’s abusive and retaliatory behavior toward women. The USADA declined to contact any other witnesses and decided to move forward in charging Ms. Blandford relying solely on J.M.’s unsubstantiated report. Despite determining that J.M. was not credible, the arbitrator decided against Ms. Blandford based almost entirely on evidence supplied by J.M., including receipts only in J.M.’s name for prohibited substances he admitted to using. Additionally, although Ms. Blandford produced witnesses who testified that J.M. had a history of manufacturing fake text messages in order to retaliate against and stalk former girlfriends, the arbitrator chose to rely on what J.M. presented as text conversations between himself and Ms. Blandford as evidence that would substantiate the USADA’s charge. Testimony from Ms. Blandford’s coach and teammate indicated that Ms. Blandford showed no signs of doping and that her performance was progressing at a level to be expected from an accomplished athlete. The arbitrator appears to have relied on a fallacy that USADA has codified into its law—that the word of someone who admits to cheating the system is more credible than the word of someone who has no history of such behavior. The arbitrator unjustly required Ms. Blandford to prove her innocence rather than require the USADA demonstrate impropriety, and in doing so has provided a roadmap for abusers to successfully retaliate against victims.